BKK GALAXY is a new Football Club for children aged 4-19 yrs which seeks to both develop technically excellent players and get them ready for competitive football matches. BKK GALAXY strongly believes in the educational value of small sided games and how it develops the thinking young player. All our small sided games are based on the works of Barcelona and Bayern Leverkusen coach Horst Wein which aims to develop Soccer Intelligence. The positive environment of discovery instead of instruction is much more stimulating than traditional training and games. Smaller players make up for their size through clever play. Rolling substitutions and equal playing time benefits everyone. Frequent repetition of basic game situations gives greater opportunity to master them. The two goals create options which stimulates creativity and improvisation. Develops support play and off-the-ball play. Learning takes place in a fully-integrated holistic environment, just as in the game itself. There is no isolation of technical, tactical or physical elements. Better game-related fitness, short duration of high-intensity vs laps. More time with coach per player. Easier to coach especially for parent coaches. More opportunities to solve game problems. More attacking opportunities (dribbling, shooting, passing). No hiding place, players do not get lost in these games, improves competitiveness & healthy aggression. More opportunities for the full range of skills. Encourages better shape and awareness of team- mates. 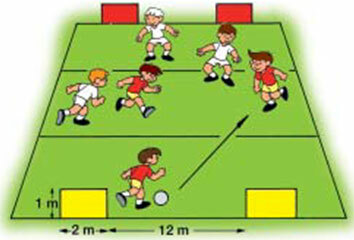 Encourages faster play, fast transition from defence to attack More involvement, more success, more fun!